Vinod Khosla started Khosla Ventures in 2004 after a very successful career beginning in 1987 as a venture capitalist at Kleiner Perkins Caufield & Byers. Before becoming a venture capitalist, he was a co-founder of Sun Microsystems. Khosla Ventures announced that it is in the process of raising a new $1 billion fund this past week. 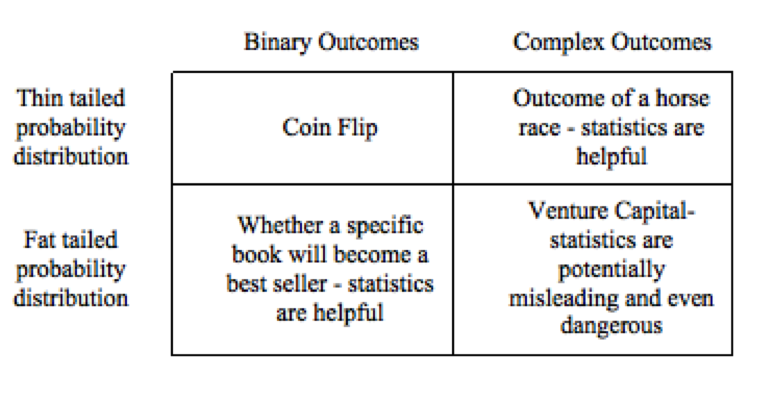 Because success in an industry is driven by the fourth quadrant/ignorance, successful venture capitalists understand that their objective is not to predict outcomes with certainty, since that is not possible. The task of a venture capitalist is instead to experiment on a trial and error basis in order to discover success from within a portfolio of 30-40 bets that have optionality. Which of these bets will pay off will be apparent only after the fact since success will emerge from the complex adaptive systems. Optionality reflects itself in the power law distributions which are familiar to any venture capitalist. There are top down financial constraints which limit the number of big winners in the venture capital industry to ~15 per year. About 200 active venture capital firms share in those ~15 deals, but in the form of a power law distribution. Fred Wilson, who I will write about soon, has written a post on the top down constraints which impact the venture capital industry. Andy Rachleff wrote a related post on venture capital economics this week. Andy and Fred don’t agree on everything, but the points they make are directionally similar. The data I have seen in industry venture capital databases puts me in Andy’s camp to the extent they disagree. 2. “We are in the company building business, not in the ‘deal’ or ‘capital’ business.” “I don’t think of myself as being in the investing business. I think private equity investors are very much in the business of doing deals, putting money in, getting money out. To me, that is a very, very different business and all that they are doing is spreadsheets. I think of myself in a completely different business of building companies. I have not made IRR calculations on a spreadsheet ever since 2004. I either believe or I don’t. If I believe, then my goal is to get involved and make things much bigger and help them be successful. It’s a different kind of business.” Great venture capitalists are focused on building companies and relationships rather than doing deals. Building a real company means building new value through genuine innovation. What Vinod is saying is that the result is so far into the fourth quadrant or the domain of ignorance that using spreadsheets is useless for venture capitalists since the inputs can’t be qualified. What a wise venture capitalists knows from experience is that if a team of individuals make 30-40 bets in each fund with potential for 10-2000X upside, it is likely that 1-4 of those bets will pay off, even though 50% of the bets will be a total write off and the rest will return on some capital or generate a modest return. Only those venture capitalist who have the skill and contacts to source the best opportunities and provide the entrepreneur with the right network of contacts and assistance will see these returns. Why the power law? People do not make decisions independently. Founders, employees, venture capitalists, and customers are all attracted to success and that success compounds in the form of a lollapalooza. 3. “If you’re doing what everybody else is doing, you’re not doing anything interesting, and we won’t want to invest.” “Doing things at the edge is what venture is about.” “I don’t even invest in businesses where six other people have the same technology.” “The idea is how can you turn a technology advantage into a business advantage? It’s much more like playing a chess game than it is investing. It is strategic, it depends how much you can help the company. Therefore, it is much more fun.”You can’t outperform a market (which reflects the consensus view) by adopting a consensus view. By definition outperforming a market means being different. The lineage of this thought goes back to Ben Graham through investors like Howard Marks. 4. “We seek out unfair advantages: proprietary and protected technological advances, business model innovations, unique partnerships and top-notch teams.” This is what Warren Buffet calls a “moat” and Michael Porter calls “sustainable competitive advantage.” Without a moat competition will inevitably drop prices to apoint where there is no economic profit. If you want to understand moats make sure to read some Michael Mauboussin. 5. “We invest more in people than in a specific plan, because plans often change.” “Failing quickly is a good way to plan. Failing often makes failures small and successes large….In small failures you accumulate learnings about what works and what doesn’t. Try many experiments but don’t bet your company on just one, keep trying, keep failing small.” “There are probably three or four things you can control out of ten that matter for the success of your company.” Competitors control another three or four. “The rest is just luck.” Partly for that reason, he is dismissive of business plans. “I’ve never seen one that’s accurate.” Entrepreneurs who can adapt are far more likely to achieve great success. No plan survives first contact with the competitors and customers in a real market. Investing in great teams generates optionality since great teams can adapt. 6. “Bad times come for every startup – I haven’t seen a single startup that hasn’t gone through a bad time. Entrepreneurship can be very very depressing. If you really believe in your product, you stick with it.” A real business operating in the real world is never about perfect execution. The great founders and venture capitalists have tremendous will to succeed. Many great successes were at one point millimeters away from failure. And I suspect that many great failures were millimeters away from success. 7. “Seeking an acquisition from the start is more than just bad advice for an entrepreneur. For the entrepreneur it leads to short term tactical decisions rather than company-building decisions and in my view often reduces the probability of success.” I see this far too often. If money is all that makes your world go around, venture capital or starting a company is not the business for you. You won’t make the right decisions and you won’t be happy. 8. “We prefer technology risk to market risk.” There are many different types of risk, one of which is technology risk. If you are a skilled technologist, technology risk is within your circle of competence. If technology is not within your circle of competence, it is best to avoid technology risk (like Warren Buffett does). Risk comes from not knowing what you are doing. Taking risk in areas in which you know you are competent is wise. It is important to note that risk is not uncertainty. It is in the domain of uncertainty that mis-priced bets are found. The best time to make bets is when uncertainty is high, like buying stocks or a venture capitalist investing in a startup in 2009. 9. “How would you compete against yourself?” This quotation is straight up Clayton Christiansen: “managers should talk about a possible innovation as something that could threaten their core business — if someone else were to do it first. Research indicates that threats, rather than opportunities, mobilize resources much faster.” Any business should be doing this, since almost certainly their competitors are doing so. 10. “I generally disagree with most of the very high margin opportunities. Why? Because it’s a business strategy tradeoff: the lower the margin you take, the faster you grow.” This is the sort of statement Jeff Bezos makes.Your competitors high margins are your opportunity to grow and absolute dollar free cash flow can be better with lower margins since you can sell more. My blog post on Jeff Bezos discussed this point in detail. 11. “Where most entrepreneurs fail is on the things they don’t know they don’t know.” There are big differences between risk, uncertainty and ignorance. Risk is present when probabilities are known, uncertainty when probabilities are not known and ignorance when future states are not known and probability is not computable. “Things go wrong. There is lots of uncertainty, and there are times when you’re unsure of yourself. I’ve found that the less people know, the more sure they are.” This is something that has always troubled me. A great story half told is somehow more convincing usually because muppets suspend disbelief since they want so very much to get rich quick. The best venture capitalist and founders are learning machines, because they realize that there is no end to what you can learn. 12. “The single most important thing an entrepreneur needs to learn is whom to take advice from and on what topic.” “Entrepreneurs could get such great help, but instead they think they need money. It’s this sort of schizophrenic divide between worrying that you’re going out of business and dreaming big that’s needed. Sophisticated entrepreneurs know this. Less sophisticated entrepreneurs don’t even know whom to ask for advice. They’ll ask a marketing and a technology question to the same person. Ask different questions of different people, both those who have been successful and those who haven’t.” The concept of a circle of competence applies not only to your own skills but to the people who you seek advice from. Risk comes from not knowing what you are doing. To reduce risk, find people to advise you who do know what they are doing. It’s that simple. Not just the portfolio but learning from and guiding their entrepreneurs into broader thinking and discussions. Also applies to each company. They can preserve and even expand optionality. A diverse team also helps expand optionality. Actually in the business of assisting entrepreneurs build companies. I will never know as much about an area than the entrepreneur who is deeply engaged but I can still challenge their thinking, help them strengthen weak links in their chain of success and help them avoid obvious mistakes that I've seen others make before. If there are six competitors, and you have a better product, it's unlikely it will matter. This is why strategies that don't put all of the future in youw own hands (like OEM contracts) often fail. Need for reaction and iteration from rapid learning is key to success. Business plan is good to judge quality of thinking of an entry but not as the plan to hold entrepreneurs to. Holding to a plan often leads to bad outcomes as areas where the environment is dynamic or hazy or where competitors are reactive. Another way to say this is "when the market is not yet solidified" and there is not too much chaos. If there is a lot of chaos in an opportunity/space, then keep your burn rate really low and be focused on early entry and lots of experiments to learn from. Too few companies do this. Instead, they believe their own BS and don't spend enough time looking for vulnerabilities. This is when a good VC can help. I always believed this and my thoughts were reinforced by the cycles that Bezos went through. Analysts and other bad advice almost dramatically reduced the Amazon opportunities, but Bezos showed real courage. The most important thing an entrepreneur does is risk management and trade risks between areas like engineering, product, marketing, financial. See my talk on managing risk. Unfortunately, it is easy to get advice all around you but hard to judge who is really qualified to advise you on what topic.